A busy month of poker on the tournament circuit in October wrapped up with the World Poker Tour Foxwoods World Poker Classic in Connecticut this week and after six days of action, it was Daniel Santoro who came out on top. Santoro defeated a tough final table that included reigning WPT Player of the Year Andy Frankenberger, former chip leader Steven Brackesy and top-notch poker pro Christian Harder, who finished runner-up after a lengthy heads-up battle that lasted several hours. Of the 200 hands played at the final table, more than half of them occured during heads-up play. Harder and Santoro exchanged the lead several times before a coin flip settled the match. With Harder closing in on the lead, he raised on the button, only to get three-bet from the big blind by Santoro. Harder moved all in and Santoro snap-called with A K . Harder’s pocket tens were a slight favorite in the race situation, but a board of J 8 5 2 K saw his tournament run come to an end. For Harder’s second-place finish, he took home $248,962. 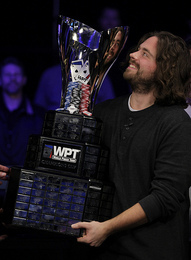 Santoro pocketed $449,910, a $25,000 seat into the WPT Championship and the WPT Champion’s Cup.